Madeleine and I returned on Sunday from the Southwestern portion of what was formerly “The Author and Her Dog Book Tour — henceforth to be known simply as “The Book Tour.” You can see some highlights of our adventure here. For a variety of reasons, Madeleine decided to stay at home for the second portion of this literary outing — okay, maybe I decided for her. 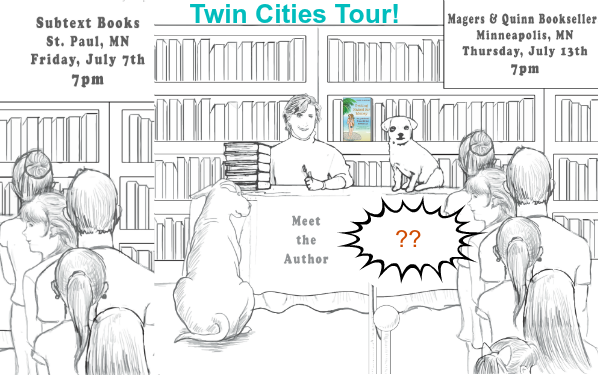 The Twin Cities will have to forgo Madeleine’s company and settle for mine alone. I promise to overcompensate. Getting Naked for Money: An Accidental Travel Writer Reveals All (GNFM) is very funny, and by now I’ve gotten my reading-to-an-audience skills down. I make eye contact, pause to breathe, and more. I have some history with the Twin Cities. 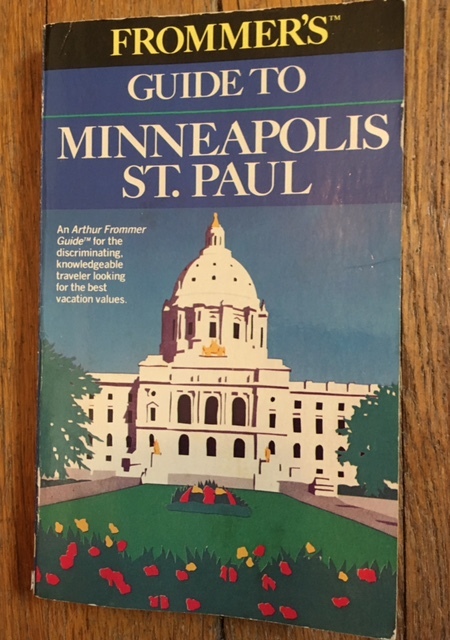 It was 1987, and “Frommer’s™ Guide to Minneapolis St. Paul” — as the title is rendered on the book’s front cover — was one of the first books I edited from scratch at my first travel publishing job, detailed in Chapter 3 of GNFM. I was just going to post a picture of the cover and go on with my story when I noticed a few things. 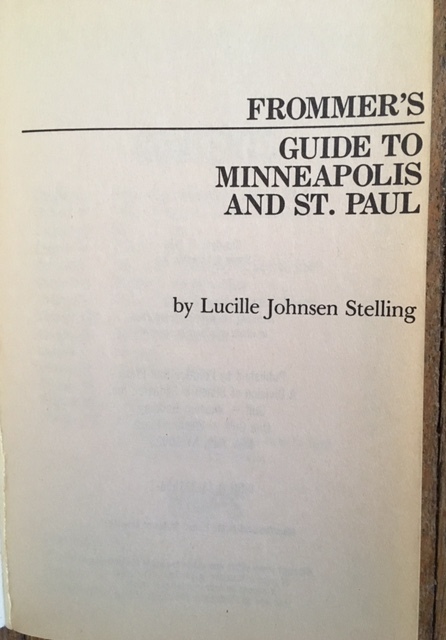 There is no “and” or even “&” between the two city names on the front cover, but on the inside title page (see picture, below), the copy reads “Frommer’s Guide to Minneapolis and St. Paul by Lucille Johnsen Stelling.” I’m glad that there’s an “and” between the city names and I’m glad the author’s name is prominent, though I would have preferred to see it on the front of the book — or at least that’s how I felt when I wrote my own Frommer’s guide. Or should that be my own Frommer’s™ guide? Where oh where has the trademark symbol — not to mention a right margin — gone on the interior title page? The back cover copy (see picture, below) has yet more iterations of the title, trademark, and Frommer name. “Arthur Frommer’s Guide to Minneapolis/St. Paul,” up top, gives us the full name of the series founder, sans trademark symbol, and has a slash separating Minneapolis and St. Paul. 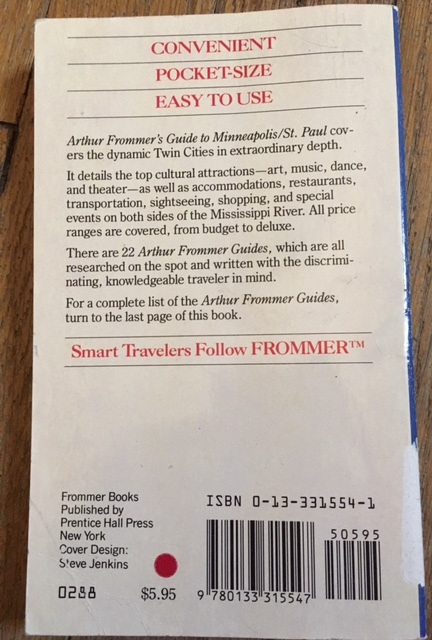 And whereas the Frommer name is trademarked in the “Smart Travelers Follow FROMMER™” blurb in red, “Frommer Books” is trademark free. Geez, the more I pore over the details, the more inconsistencies I find. On the front cover, “An Arthur Frommer Guide™” was trademarked; on the back, it’s plain old “Arthur Frommer Guides.” Maybe the plural rendition of “guide” puts the series name into the public domain? Or is it the color red that earns a “™”? The capitalization? The italics? I’m guessing that the problem is– gasp! — sloppy editing, even though Prentice Hall Travel, a division of Simon & Schuster, was a pretty hoo-hah company, and even though this was the late 1980s, an era when editing was supposedly taken seriously. When I started this post, I did not plan to pick apart the Minneapolis/St. Paul guide. Honest. But since I went there, a disclaimer: I had nothing to do with these editorial/artistic errors. By this final stage of production, the book was out of my hands. I was responsible only for “graciously guiding” the author through the strictures of the Frommer’s/Frommer’s™ format, as she put it in her acknowledgements. Stelling… a college professor, theater critic and travel writer for many years, died May 26 in North Kingstown, R.I. She was the author of ‘Frommer’s Minneapolis & St. Paul’ travel guide. Born in 1924 in Brooklyn, New York, she was the daughter of William and Jean (Weissman) Lokos. She was an avid Dodgers fan, a graduate of Erasmus Hall High School and Brooklyn College. Moving to Minnesota, she raised three children in Edina and then earned a Ph.D. in Theater at the U of M. Lucille taught first at Metropolitan State Junior College, and then launched a 25-year stint at Normandale Community College, teaching literature and writing. Our bios have many similarities, including being expat Brooklynites and Brooklyn College alums who loved the Dodgers. But I digress again. What I wanted to tell you was that Frommer’s editors were not given the time or expenses to travel to the destinations covered in the books we edited. I have never visited the Twin Cities, and am very much looking forward to remedying that. Before I began this post, I thought about using the old guidebook to find my way around, just for laughs. I’ve changed my mind. Who knows what belated editorial remorse might dog me? I’m already having agita about the way I used the Frommer’s trademarks — or not — in GNFM. One of the reasons I chose to do book signings in Minneapolis and St. Paul is that I have a variety of friends there. Some are old (as in I’ve known them for ages, but who are also my age, so yes, not young); some are new; some are virtual. Some know me through jobs or through classes we shared, others through my writings about Madeleine and her predecessor, Frankie. I hope my doglessness won’t deter these last from attending my readings. If you can’t make it because you don’t live in the area — really, your only excuse — tell your friends who do. It’ll be fun, I promise. No nitpicking will occur — but I hear y’all are having tick issues. I will definitely tick-pick if need be.